This is a very easy recipe about how to roast delicious butternut squash. It only requires a few simple steps for you to make this delicious side, perfect for risottos, salads or soups. And of course it's vegan. Butternut squash is one of my favourite autumn vegetables. I love the colour, the smell and the taste and it works best roasted or in soups. First cut off the ends. Using a spoon remove the seeds and fibres. Cut into bite-size cubes or slices and then season to taste with olive oil, garlic, pepper and a generous amount of salt. If you like it sliced then check out my rosemary roasted butternut squash in a mushroom and lentil tomato sauce here. Transfer to a bowl and season with a good amount of olive oil, garlic powder or pureed garlic and salt and pepper to taste (I normally use quite a lot of salt as the butternut squash's sweet taste can be overpowering). 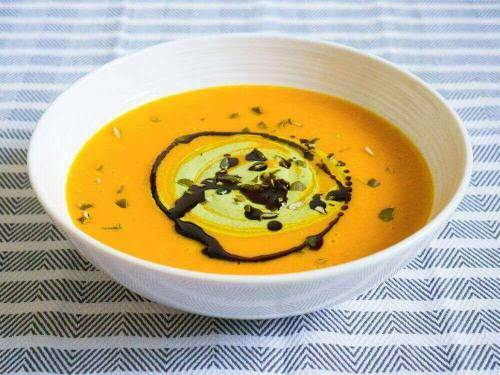 You can also add the juice of 1/2 lemon for a more tangy taste as well..
And if you like more butternut squash recipes also check out my delicious butternut squash and orange soup here.